3D Design software such as Pro/DESKTOP® allows the designer to produce three dimensional representations of his/her ideas. When completed the design can be viewed on the screen and it can even be revolved and examined at any angle. 3D software such as Pro/DESKTOP® is much more complex than 2D software such as TechSoft 2D design. It requires specialist training before it can be used competently. 1. The designer draws up the design using software such as Pro/DESKTOP®. The design can be examined in detailed and if modifications/alterations are needed they can be made on the screen. Software of this type allows the designer to model his/her idea on the screen rather than make/manufacture an expensive model. Good 3D software allows the designer to design almost any item. 2. The design is processed. When the design has been completed using Pro/DESKTOP® it must be exported as a stereo lithography file. This type of file can be imported into processing software such as Boxford’s 3D-GeoCAM which converts the drawing into a long list of coordinates. Each set of coordinates is called a GM code. 3. 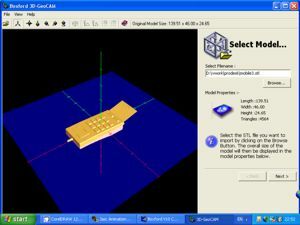 Most CAD/CAM software allows the designer to test the manufacture of his/her design on a computer rather than actually making it. This saves time and materials. Testing designs is carried out using ‘simulation’ software. When the design is run through simulation software the computer displays the manufacturing on the screen. It also checks whether or not the design can be manufactured successfully. Many designs have to be altered before they can be made by a CNC machine. 4. An advanced CNC machine such as the A3 HSRi² (Boxford Machine Tools, Halifax, England) can be used to manufacture the three dimensional product. This CNC is both fast and accurate making suitable for school and industrial use. 1. Suggest an object that is best designed through the use of 3D designing software rather than 2D. Why is this the case? 2. Draw a flow chart that shows the stages from designing to making an object using 3D software.